Kirk Wangensteen, MD/PhD specializes in Gastroenterology and Hepatology and his clinical expertise includes genetic diseases of the gastrointestinal tract, pancreas, and liver. 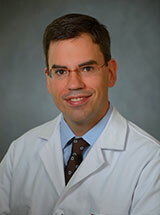 Kirk Wangensteen, MD/PhD's research expertise includes liver biology and genetics. In particular, he is mapping the genetic pathways that enable liver regeneration and cause liver cancer. He has set up innovative in vivo screening systems to elucidate these pathways in a mouse model of liver injury and repopulation. Kieckhaefer, Julia, Maina, Flavio, Wells, Rebecca, Wangensteen, Kirk: Liver cancer gene discovery using gene targeting, Sleeping Beauty, and CRISPR/Cas9. Seminars in Liver Disease 2019 Notes: In press. Mahmud Nadim, Wangensteen Kirk J: Colocolic intussusception. Arab Journal of Gastroenterology 2019. Preziosi Morgan E, Zahm Adam M, Kaestner Klaus H, Wangensteen Kirk J: LXR agonism and Sorafenib treatment as novel combination therapy for hepatocellular carcinoma. Experimental Biology 2019 Notes: Oral presentation. Abstract to be published in The FASEB Journal. Wangensteen Kirk J, Wang Yue J, Dou Zhixun, Wang Amber W, Mosleh-Shirazi Elham, Horlbeck Max A, Gilbert Luke A, Weissman Jonathan S, Berger Shelley L, Kaestner Klaus H: Combinatorial genetics in liver repopulation and carcinogenesis with a in vivo CRISPR activation platform. Hepatology (Baltimore, Md.) 68(2): 663-676, Aug 2018. Wang Amber W*, Wangensteen Kirk J*, Wang Yue J, Zahm Adam M, Moss Nicholas G, Erez Noam, Kaestner Klaus H: TRAP-seq identifies cystine/glutamate antiporter as a driver of recovery from liver injury. The Journal of clinical investigation 128(6): 2297-2309, Jun 2018 Notes: * co-first authors. Wang Chao, Chen Wen-Jian, Wu Ying-Fu, You Pu, Zheng Shang-Yong, Liu Chang-Cheng, Xiang Dao, Wang Min-Jun, Cai Yong-Chao, Zhao Qing-Hui, Borjigin Uyunbilig, Liu Wei, Xiong Wu-Jun, Wangensteen Kirk J, Wang Xin, Liu Zhong-Min, He Zhi-Ying: The extent of liver injury determines hepatocyte fate toward senescence or cancer. Cell death & disease 9(5): 575, May 2018. Shoshkes-Carmel Michal, Wang Yue J, Wangensteen Kirk J, Tóth Beáta, Kondo Ayano, Massassa Efi E, Itzkovitz Shalev, Kaestner Klaus H: Subepithelial telocytes are an important source of Wnts that supports intestinal crypts. Nature 557(7704): 242-246, May 2018. Mahmud Nadim, Wangensteen Kirk J: Endoscopic Band Ligation to Treat a Massive Hemorrhoidal Hemorrhage Following a Transrectal Ultrasound-Guided Prostate Biopsy. Annals of coloproctology 34(1): 47-51, Feb 2018. Wang Min-Jun, Chen Fei, Liu Qing-Gui, Liu Chang-Cheng, Yao Hao, Yu Bing, Zhang Hai-Bin, Yan He-Xin, Ye Yibiao, Chen Tao, Wangensteen Kirk J, Wang Xin, Hu Yi-Ping, He Zhi-Ying: Insulin-like growth factor 2 is a key mitogen driving liver repopulation in mice. Cell death & disease 9(2): 26, Jan 2018. Zahm Adam M, Wang Amber W, Wang Yue J, Schug Jonathan, Wangensteen Kirk J*, Kaestner Klaus H*: A high-throughput pairwise microRNA inhibition screen in the regenerating mouse liver. FASEB Liver Biology Conference 2018 Notes: *co-corresponding authors.